Because they start feeding at sunup, make sure your feeders are ready for business by filling them in the evening. Birds will find your provision for them — shelter, water and food — when you make the effort to welcome them in the following ways. Whether you purchase or build a feeder, ease of filling and cleaning, and a protected seed hopper large enough for several day’s use should be a consideration. 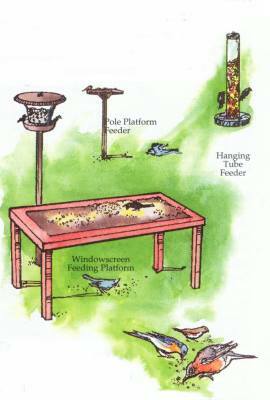 Unless it is supplied at time of purchase, you might want to build your own hanging screen-table for underneath the popular thistle-seed feeders. 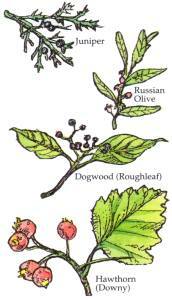 It will conserve seed and reduce their sprouting in your yard or garden below. Migration takes it across the Gulf of Mexico, 500 miles on about 2 grams of fat. A real acrobat, the hummingbird has been clocked at speeds of over 50 miles an hour, yet can hover motionless and fly backwards in its feeding activity. Specialized feeders are required for these guests, and also special food in the form of imitation nectars. 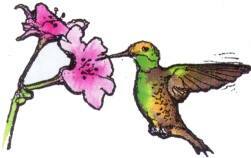 Whatever the feeder design, their attraction is in the use of red blossom shapes, with a reward of prepared nectar. 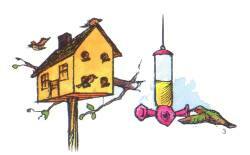 If you make your own treat for these feeders, avoid using honey, which can mold easily. One part of sugar to four parts of water by volume, boiled, is a suggested recipe. 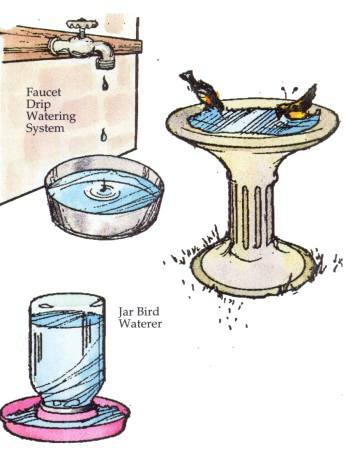 Have your hummingbird station ready in early spring. Some of their favorite natural fly-ins include honeysuckle, petunias, phlox, nicotiana, azaleas and trumpetvine. They’ll help you keep you yard clear of insects too! 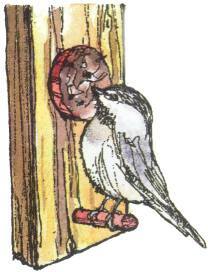 You are the innkeeper, and it’s your decision to feed all comers or just the smaller birds. 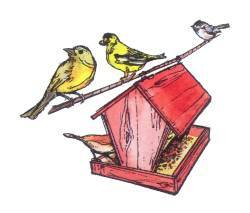 With perch-type feeders, reducing the length of the pegs will make it harder for grackles or cowbirds, for example to get a toehold. is to build strong feeders in the first place, be prepared to devise countermeasures, and to enjoy the daily exploits of these wily, four-footed foragers. Another alternative is to set up a squirrel feeding station with ear corn or some other favorite food at a distance from the bird feeder. This, however may also be attractive to raccoons or possums. T. and T. is another solution — trapping and transporting. Box-type traps are humane, but should be opened at a remote destination as soon as possible to release the offender. 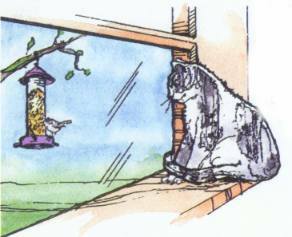 For neighborhood cats, try to allow as little cover as possible — make it easy for birds to see the danger. 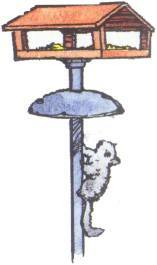 And hang feeders high up — cats can leap more than four feet off the ground to bring down their prey. Keep a pair of binoculars handy, together with an illustrated guidebook for bird identification. Watch how the goldfinches dress up for spring and look for new visitors passing through as the seasons change. You’ll enjoy these customers more, just knowing how you’ve helped them with a healthful menu at your feeding stations.